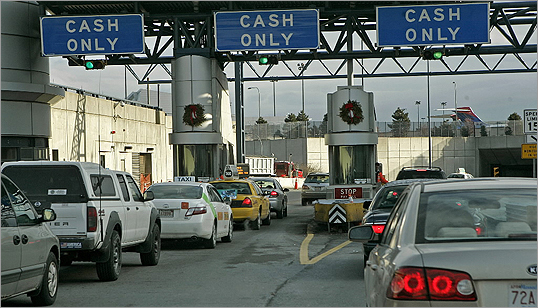 (Globe file) Cars line up in front of Boston's Ted Williams Tunnel. A new study shows that people who move to outlying Boston suburbs for affordable housing often sacrifice the savings to higher transportation costs. People who move to an outlying Boston suburb to find affordable housing or to get more house for their money often sacrifice the savings to higher transportation costs, according to a study to be released today by a national planning and land-use organization. The report, by the Urban Land Institute, is the first to quantify by community not only commuting costs, but the price of daily transportation around often-sprawling suburbs. When driving costs are added to housing costs, the institute found that, for example, the average household spends more each year in Dracut ($35,643) than in Cambridge ($28,671), and more in Stoughton ($37,513) than in Brookline ($36,846). “What we have too frequently thought is that you can get an affordable house if you drive until you qualify, but if you then overlay the costs of transportation, they get very high,’’ said Henry Cisneros, secretary of Housing and Urban Development in the Clinton administration and a board member at the institute, a research group based in Washington, D.C. Many people are familiar with federal guidelines that suggest households spend 30 percent or less on housing, but fewer people consider the transportation costs associated with a home or community because of an absence of data, Cisneros said. “When transportation is figured in there — because that’s what it takes to get home — it becomes untenable,’’ he said. The study found that across Greater Boston, the average household spends $22,373 on traditional housing costs and $11,927 on transportation, from car payments and gasoline to T passes and bike tires. That $34,300 represents 54 percent of median household income in the region. One of every four communities in the study area has a combined housing and transportation cost that exceeds 58 percent of median household income, which the report defines as an extreme burden. The report bolsters those who have championed ride-sharing programs in areas that lack public transportation and encouraged people to consider what they could save by carpooling. One such advocate is Andrea Leary, a transportation consultant who oversees a network of transportation management associations across the state, working with businesses and local governments to identify potential carpoolers and reward them with gift certificates and other incentives. “[People] should think about what the cost is to them financially, the cost to the environment, the cost to their personal well-being and savings, and the cost to their family time, their work-life balance, because those are all key elements of a healthy life,’’ she said. Household transportation expenses differ dramatically from place to place, based on proximity to rail and bus routes, and how often residents need a car to get to work, pick up a gallon of milk, or collect children from activities. Those transportation costs, in communities with at least 10,000 households, ranged from a low of $6,540 per home per year in Cambridge to a high of $14,853 in Franklin. In Boston, residents spend an above-average chunk of their income on housing (41 percent), but the comparatively low cost of transportation puts the combined housing and transportation burden in that city at 56 percent. Mayor Thomas M. Menino, who plans to appear at Faneuil Hall today for the release of the study, said his administration has encouraged affordable and middle-income housing, as well as office and retail space, at transit stops. He cited mixed-use developments at the Ashmont and Jackson Square MBTA stations as examples. Residents of the Boston area spend a lower fraction of their income on housing and transportation than do people who live in the San Francisco area — 59 percent — but more than those in the Washington, D.C., area — 47 percent. Those three regions are the first studied by the researchers, who wanted to examine metropolitan areas where high housing costs pushed many nurses, teachers, firefighters, and other middle-income earners beyond the urban core in search of affordable housing. The study, entitled “The Boston Regional Challenge’’ and prepared by the Urban Land Institute’s Terwilliger Center for Workforce Housing, is not a manifesto for abandoning exurbs and returning to cities and inner suburbs. Rather, it is intended as a guide for officials, developers, home-buyers, and renters to the costs of transportation in 323 communities in Eastern Massachusetts, southern New Hampshire, and much of Rhode Island. The Urban Land Institute is releasing the Boston report this morning along with the launch of a website, bostonregionalchallenge.org, where consumers can calculate costs of transportation and housing for each city and town in the region. The report offers data to make a case many land-use planners have espoused for years: creating more middle-class housing in denser developments near shops, businesses, and transit stops; and concentrating development in areas that are already built up, rather than launching new construction projects in what is left of the region’s open space. “The main thrust that we’re trying to make is that there is a group of people in this country who are very worthwhile, hardworking, and make our society work, who are being forced to live too far away from where they work so they can afford a decent home, and that’s unfair, and that ought to be addressed,’’ J. Ronald Terwilliger, a retired housing developer who endowed the center, said in a phone interview.